Pika sits by his burrow when Hare hops up. "Where are you going?" asks Pika. "I come from behind me and I'm going ahead," replies Hare. Hare looks down at little Pika and chuckles, pfft-pfft. Hare's cleft lip quivers when he makes that sound. Pika does not know why Hare chuckles. Before he can ask, a gust of wind blows sand in their faces. Pika backs into his burrow, but Hare says, "wait, wait," as he wipes the sand from his face with his forepaws. "The sand reminds me of a story. You want to hear the latest? Well, maybe it's not so new. Another hare told me, and he got the story from someone else, who..." Hare leans over and whispers: "The whole village danced - on pikas." Hare laughs and wiggles his long ears. Then he twirls around and wiggles his white, fluffy tail and stamps his furry feet, THUMP THUMP, in a hare dance. Then Hare continues, "A production team from the village was building a fence. Pika holes everywhere. Wind blew sand into people's faces. Shoes sank into soil made soft by all the pika burrows. Gajia. the leader, had an insight: pikas cause sandstorms and erosion by digging and they eat all the grass. You know how people jump to conclusions." "Anyway," says Hare. "Gajia gave an order: 'The soil is too soft. We must pack it down. We must fill the pika holes.' The next day the villagers all came. You know how Tibetans love a picnic. They came with thermoses of butter tea, bread, and chunks of boiled mutton. They ate, and laughed, and were in good mood. Then they went to work. At first they just stamped their feet." THUMP THUMP goes Hare. "After that they danced, stomping the ground and singing, and holding their arms aloft." Hare thumps his feet, rises up, and spins around singing through his voice sounds like a squeak. THUMP-SQUEAK-THUMP. "After that they shoveled sand into the holes. It did pack the soil down." "What happened to the pikas?" asks Pika. Hare chuckles and his lip quivers again. "We hares don't dig much. A scrape here and there. But you pikas are fanatics, always digging. 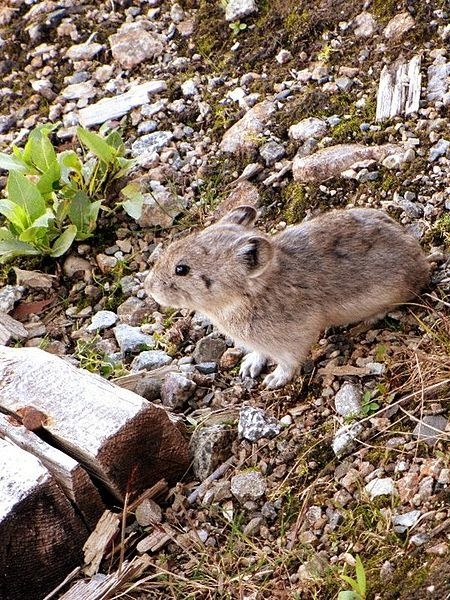 Nothing happened to the pikas: they simply fixed up their homes. But Gajia was angry. He wanted hard ground and he lost face. So he got poison from the government. End of Pikas." Pika is unhappy with that story. He lowers his head and his whiskers droop. Hare notices and says, "Wait! An interesting ending. You should be able to guess it. But you dig so much you don't take time to think like us hares. Action is easy, thought is hard. With the pikas gone, the soil packed down. When it rained, the water ran off, causing erosion. Soft soil absorbs and holds water. Grass grows well when it has moisture and is tender and nutritious. Grass grows poorly on hard soil and is tough to eat. Your digging helps all those who eat grass. Gajia had thought you pikas are harmful pests." Pika says smugly, "A little knowledge is a dangerous thing."